Clark Stationery - Embossed Graphics - For all Gift Enclosure choices click Embossed Graphics to go to our sister site to order. Item Name: For all Gift Enclosure choices click Embossed Graphics to go to our sister site to order. Description: For all Gift Enclosure choices click Embossed Graphics to go to our sister site to order. 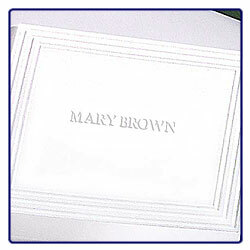 50 enclosure and matching envelopes in White or Ivory. 3" X 2.8". Great to have on hand for gifts of all kinds.